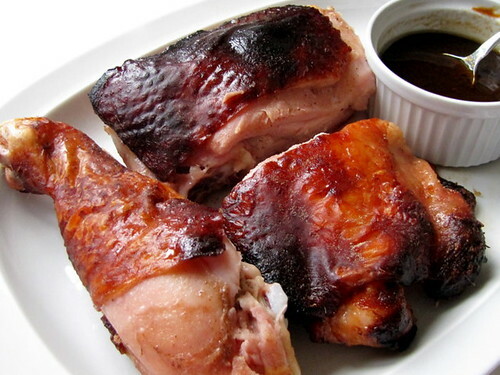 Five-Spice Crispy-Skin Chicken ~ I Can Do That! The original plan was to deep-fry a whole chicken but I decided on baked chicken halves instead because I'm not too keen on deep-frying. The recipe is from my ancient Wei Chuan's Chinese Cuisine cookbook by Huang Su-Huei which is my favorite of all my Chinese cookbooks. The recipes in this book are simple, authentic, and delicious. Perhaps I deviated too much from the recipe, the result may not be representative of the book's recipe. The skin came out crispy enough but probably not as crispy as deep-fried. But the flavor and aroma of the chicken are fantastic and the meat so moist. The 5-spice powder, honey, rice wine, and vinegar all go well together. I like it a lot. It's finger lickin' good. Rinse and pat dry the chicken. In a small skillet heat salt over low heat until very hot. Remove from heat and stir in the five-spice powder. Let cool then rub half of the mixture into the cavity of the chicken. Reserve the other half to serve with the cooked chicken. In a small skillet heat the rest of the ingredients except oil until honey is dissolved. Baste the chicken with half of the mixture until completely coated. Reserve the remaining honey mixture and keep in the refrigerator. Place the chicken on a rack set on a baking sheet pan and refrigerate uncovered for 2 days, basting with the remaining honey mixture, until the skin appears dry (the book says to hang outside to dry for 8 hours or use an electric fan indoors). Heat oil in a deep pot or fryer and fry chicken over low heat for 30 minutes. Turn the heat to high and fry for 2 minutes more or until golden brown. Remove from oil and drain on paper towels. Cut into serving portions. Serve with lemon wedges and the remaining 5-spice salt. My chicken obviously does not have cavity. I rubbed the 5-spice salt on the meat under the skin and all over the exposed meat. It has just the right amount of salt and the skin has a hint of sweetness from the honey. To bake: Preheat oven to 325° F. Bake on a metal rack set on a roasting pan until golden brown and juices run clear. Chicken halves: 1 hour; whole chicken: 1½ to 1¾ hours. that looks sooo good! all that spices must have already been infused with the chicken meat since you had to let it 'rest' for two days...so fried or not am sure it's tasty! i prefer baked than deep-fried, too. the ingredients sound interesting, must be really delicious! I got that 5-spiced months ago but never tried it on chicken yet...looks yummy! Love your avatar btw. That looks good, Oggi! The skin looks so yummy! That looks great. I have a jar of 5-spice I have been trying to use up for months. Maiylah, yeah, marinating for 2 days made it flavorful. Luna Miranda, I deep-fry once in a blue moon, bagnet usually. Iska, the skin is almost like chicharron. Joy, it's also excellent for Chinese pork hocks humba.